If you’re looking for ways to make money online fast but you don’t yet know what matched betting is, then we absolutely recommend you check out our definitive guide: What is Matched Betting? If you want to carry on reading this guide, we are going to make the assumption that you are familiar with the concept of matched betting and that you understand it’s entirely possible to make a living online with betting. How much are you planning to earn from matched betting? You need to be realistic in the figures that you think you can achieve, based on the hours you put in. We’d suggest that an average of £1,000 profit (tax-free) each month is achievable for full-time matched bettors, with £1,500+ profit capable on good months. These are just hypothetical examples, please note. Our best month since turning full-time is well over £6,000 – that’s one person. What do we mean by ‘full-time’ anyway? In matched betting, we’d say full-time is 2-3 hours a day. Matched betting is 100% tax-free, meaning that a £1,500 monthly profit is actually equivalent to a taxed salary of over £20,000. Not too shabby for a couple of hours at a computer from home each day. If you’re able to break that £2,000 profit margin each month, you’d earn a minimum of £24,000 in a year – which is the same as having a salary of over £30,000 in a regular job! This is all achievable with just one account with each bookmaker and casino. One thing that will be essential for matched betting to earn a full-time income is your bankroll. Your bankroll is the money that you will solely invest in matched betting, not all of the money that is in your bank. In fact, we’d recommend you actually use a separate bank account for matched betting; this will really help you become more organised, but it isn’t essential. A separate bank account will also be useful if you have a few, or many, outgoing payments each month such as rent or mortgage payments, along with direct debits. Ensuring you have more than enough money set aside to pay your bills is of course a fundamental part of ‘turning pro’. If you’re looking to earn a full-time income, you’re going to need an absolute minimum of around £4,000-£5,000 in your bankroll. Ideally, you’ll need a little more than this. This can of course be earned by steadily building your matched betting profit over the course of a few months, before going full-time. You only need £100 or so to start matched betting in the first place. You should easily turn this into thousands of pounds within just a few short months if you put the work in. If you’re lucky enough to already have a few grand spare then you will be able to make the bigger money instantly, as long as you put the work in and follow instructions carefully, although we’d still advise getting in slowly rather than diving in head first. It’s important to note that you will rarely need to use all of your bankroll in one go. However, in the event that you ‘win’ all of your money out of your betting exchange into bookmaker’s accounts or vice versa, you’re going to need to be able to deposit extra funds when necessary whilst you wait for withdrawals to process. The withdrawal process typically takes 2-5 days with most bookmakers, just as it would for any refund from any shop. Your bankroll is more of a safety net than anything. In order to make the most amount of money from matched betting, you’ll need to have a pretty good schedule in place. Following someone else’s exact schedule will never be for you, so you’ll need to find a good balance of what works for you. Everyone has a different life, everyone has different commitments, so figuring out what works for you through trial and error is a big part of the fun when you go full-time. Mornings: look at any new offers for the day ahead – after your lie in, of course! Jokes aside, lie-ins should be used sparingly in our opinion. Getting up and being active is a great thing to recommend when you’d otherwise be stuck at the computer for large chunks of the day. Afternoons: bet on the horses trying to earn refunds or free bets from these. Look into accumulators to place. Tennis is another event that can often be matched bet on during the day. Fire up some casino offers. Always try to use your free spin offers, no matter how tedious. On quieter days, look to improve your Betfair trading knowledge. Evenings: bet on the football, trying to earn refunds or free bets from these, lay off accumulator matches for the next day. Horse racing and greyhounds are also possibilities on some evenings, along with sports such as darts and snooker. Again, casino is always a possibility, there are also outside shouts to look into like bingo, poker tickets & trading. Weekends: these will be your busiest days by far. For most matched bettors, it’s not unrealistic to hit 50% or more of your weekly profits from the weekend alone. Because most football takes place in the day on weekends, and there are usually an increased number of other offers available too, it can be a bit of a frenzy. This is where it becomes important to map out your day ahead. On Saturday and Sunday mornings, map out the best horse races for hitting refunds. Also, plan the football promotions that you’ll definitely want to be betting on. The more bets you can actually place earlier on in the day, the easier it will become later on. However, it’s not always possible to find good matches between the back and lay bets until closer to the event. The more organised you are and the more you stick to a schedule, the more efficient you’ll be with finding, placing and tracking bets. An extremely important part of matched betting is a technique known as mug betting. Mug betting is what makes you look like a regular punter in the eyes of bookies. Bookies are relatively happy for you to do matched betting, as long as you don’t take too much value. Mug betting is the way you give a little back to them, without actually giving anything (or much) back. The process of mug betting involves betting on races or matches that won’t qualify you for offers. To the bookie, this stops you looking like a ‘bonus hunter’ as you clearly want to bet on all events and not just ones that might qualify you for a free bet. We’ve covered advanced mug betting if you want to learn more about the intricacies of keeping your bookmaker accounts healthy. If you’re familiar with the Beating Betting website, you’ll probably know that we recommend using Oddsmonkey for most matched betting needs. Side note: you can sign up to them for free, if you still haven’t, via this link. However, if you’re planning on trying to use betting for your sole source of income, it is definitely advisable to consider adding another tool or two to your arsenal. For the most part, another subscription will only cost a couple of day’s worth of profit at most and it could only take one great offer to recoup the cost of it. The number one alternative tool that we recommend is Profit Maximiser, and this is because they cover such an alternative area to Oddsmonkey. Profit Maximiser specialise in casino offers, meaning they’ll list a significantly higher list of offers in this area and they can be incredibly lucrative (although higher risk). You can try out Profit Maximiser via this link for just £1. For finding other potentially valuable tools, you can check out the review section of our site. If you have an appropriately-sized bankroll (£3,000), we’ve released the Fortuneteller system for people looking to make extra profits every month. 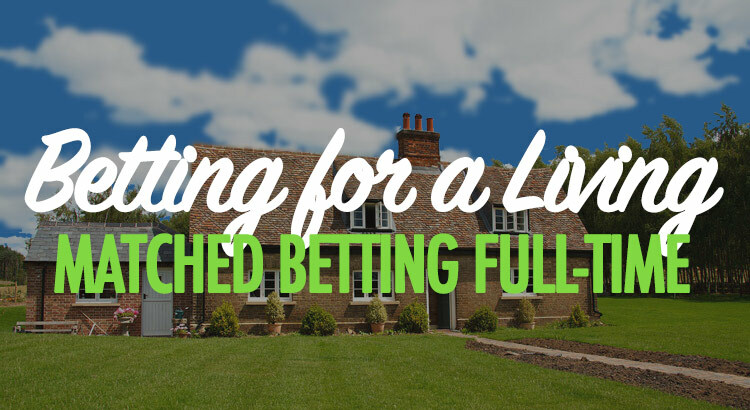 If you have any questions about earning a full-time living online with matched betting, please don’t hesitate to drop us a comment below and we’ll be sure to answer any queries you may have. Is it possible to place a 4-6 fold accumulator bet and laying it all at once for mug betting? Yep that is completely possible using the acca software on Oddsmonkey. is their an online bank account that I can use just for matched betting and is there a limit in how much can be made from matched betting per month? Yeah there is, things like Cashplus will charge you a monthly fee of around £5.99 I think though and have a limit on how much you can store in them. Or PayPal/ffrees and other things too. Is there a limit? All depends on the offers available. Do bookmakers send anything to your home address like letters or statements ? The occasional one may send a promotional leaflet or something but that’s about it. Never received any form of statement. Hi, I am looking to start doing matched betting, but I am just wondering who you would recommend to go with for a second bank account. I am with nationwide, would it be okay to set up a second account with them for matched betting. If not, I was considering using frees (ubank) but I have 2 concerns with them, one, is that they offer no funds protection if they fail and two, they only seem to offer a pre-paid debit card, do I not need a real debit card for the bookmakers? many thanks and great website. Blimey, bank accounts? No idea on that one to be honest, that’s not my specialist subject! I would say go with one that you can trust and will give you best interest rates or perks etc. Hi Luke, when you refer to full time being 2-3 hours per day, do you mean 5 or seven days per week? Just trying to work out how viable this is for me and my circumstances. Donna, it depends really. It’s the 7th of the month, I didn’t work the weekend (although did have 2-3 bets placed for the weekend on Friday) so only the 5th working day, and I’ve already made 2/3 of my old wage in profit. I could keep going for another 2-3 hours a day for the next week and then take the rest of the month off if I wanted to! I won’t do that, but when you’re not chained down to anything, you can pretty much work whenever you want. There will be months where you need to work harder for the money, but March is a great time due to Cheltenham. I should be able to earn 2-3 months wages if I graft hard this month! your footsteps around the net (like from one account to another) like ghostery ? Or do you just have manually blocked stuff like iesnare,mpsnare to stop it from sending data back to them ? Would be very interesting to know as you do that extensively and I would assume without certain security measures you would quickly lose accounts despite all the mug betting.I mean if they see you move from bookmaker to bookmaker and using various sources it´s becoming obvious that you could be matched betting and thereby quickly see your accounts restricted. There’s lots of subscription sites put there (PA/oddsmonkey etc). Are they worth it? Simple answer: Yep. If you’re wanting to make more than a couple of hundred quid a month then they are essential. I am trying to get my head round it all as much as possible! So you have approximately £3,000 to play with? That sounds great, but it depends how much you need to make to live off as a main income. This can depend on a range of factors including where you live and what your current outgoings are. I’d say that with your current bankroll, you’d be looking to make £800 – £1,000 profit a month on average. Let us know if you get stuck and we’ll be on hand to assist. Hi Luke, apologies for the delayed response! Busy moving house etc! I would say my outgoing would be between 650-750 per month. So if I made £1000 that would be great. I have a partner who will be working full time (while I study) but this would certainly help. My name is Louis and am new to mached betting. I’d like to know: What’s a horse betting refunds? Thanks. By the way your info is very good and helpful. Thanks for your kind words. Horse betting refunds are just free bets generated via betting on horse races. This is something you’ll pick up once you make it past the sign-up offer stage. Plenty of bookies can track that you’re using a VPN and won’t allow access to the site. I wouldn’t advise running multiple accounts through the same device. The info is really motivating. What is your take on Cricket bets. Glad to hear it. There are some great cricket offers flying around at the moment – if your account has the profile of a cricket bettor then I don’t see a problem with them! You do just have to be slightly careful with the T20 rules around super overs. You’ll struggle to make that in your first week because you’ll need to wait for matches to settle, especially with such a small starting bankroll. We recommend a starting balance of £100 minimum and with that you’d likely make £500+, but within a 3-4 week period rather than 1 week. From what I know of it, you need more than £50 to start and 6 hours is far too many. I have a bankroll of about £150 but due to work commitments I’m only free evenings and Sunday with 1 day off through the week will it be possible to do my bets the evening before? No reason why you can’t make a bit of money this way. Hi, I am pretty much in same situation as Shaun time wise however have most Saturdays available with a bankroll of 5k or so. What should i expect to get back in a month or so with this kind of limited time? Appreciating the help so far, just waiting ti take the plunge. I’m just getting back into Matched Betting after taking a year out for other commitments. I’ve literally just moved £100 into another bank account and I’m about to do my latest £5 offer as well as having a £20 casino offer emailed to me. My hope is that I’ll bring in £1500 per month by the end of this year, is that possible do you think? Definitely possible if you put the time in and keep reinvesting. Hi I have about 1500 -2000 start up bankroll and plenty of time but I have used all betting sites free offers over the years is this still possible for me to make good money? Yes Kris, absolutely possible. As long as you’ve not been banned from any (or many) bookmakers, there’s plenty for you to make. Personally, I think £100 starter money will make for a really slow return as I’m finding out. Also, some of the bookies take forever to give you money. 10 days!!! With £100 you are looking at doing 2-3 offers in your first week, a couple more the week after and build from there. I’m a pretty experienced matched bettor . My question is . I’m “helping” some friends with a little matched betting . They want me to do a few offers with them but set up the accounts etc . Now getting them to set up new bank accounts is a little bit of a pain so I was wondering about Lee paid cards and if you’ve any experience in tryinf to matched bet with pre paid cards or something else easily set up and nearly universally accepted . Is it possible to open multilple accounts with the same bookies for new offers? i.e. let’s say Betway have a £30 sign up offer. Can I sign up using my hotmail email and Barclays bank account for this deal, and then also sign up again using my Gmail account and Halifax bank account? No, you’ll need to verify your account using your ID and they’ll quickly find you out – you could lose money and it could also be classed as fraud. Hi I’m from the Philippines. Will I be able to do this? Also, how do I encash my money? Can I possibly do Paypal? Or an online bank account? Thanks! I’m a novice and just starting out, only made 50 odd profit but that’s just on two sign ups. I have £5000 to use for bankroll and am interested in pursuing matched betting. How much could I realistically expect to earn from this per month? First of all I really appreciate all the advice so far, I am quite new to matched betting and I am already very excited at the prospect of making a nice bit of cash. I was wondering whether it is reasonable to assume that I would be looking to make 80% of the value of any free bet that I accumulate? Hi Paul, yes that is completely reasonable. If you learn advanced techniques as you progress, you can even achieve 90%+ retention. Hi Luke, I signed up to Oddsmonkey just 7 days ago and with a pot of about £125-£150 I’ve managed to make a profit of £103.46 in 6 days and have had some scary moments, more from my own human errors, but got out unscathed! I just wanted to ask was it really stressful for you in the beginning and once the offers run out how do you make a profit without free bets/risk-free bets, etc? I don’t understand how you can make money with your own money if you get what I mean? I’m still trying to work my way around the Oddsmonkey site and from the very little I’ve seen, accas look like you need a PhD to understand them, lol! Also, Casino and Bingo fill me with terror because they are not guaranteed profits. What are your thoughts? Are these just typical newbie fears? Most interested where you get most of your profits once offers have dried up. Thank you for your inspiring, generous and informative website. I’ve been trying to contact you about your free course- difficulties despite using different email addresses and browsers, but also apparently your email address given on your website is not currently operative either. Is there another one please? What relevance does the size of your initial pot have on MBing? Does putting more in to begin with mean you can make more money? Or does it just mean you burn through the free offers more quickly before then going on to the reloads? I have a few thousand I could put in but I’m not sure if it is necessary. Secondly, I’ve read in quite a few places that £1500 a month is fairly easily achieved (from several hour’s work a day) and you can even make £2000 +. Does that figure reflect the maximum you can expect from MBing? There are no embarrassing questions here! Best of luck on your betting journey! Up until a couple of weeks ago, buying the occasional lottery ticket was the sum total of my experience with gambling. I then came across a post about Matched Betting, did the math and it works out. Bankroll wasn’t an issue for me but I’m trying not to get ahead of myself and am now about halfway through the New Customer offers, soaking up all the information and tips I can find along the way. Now I fully understand the implications of being gubbed by the bookies this early into such a potentially easy way of earning money so I thought I’d better ask somebody who is earning a living from doing it. With me taking such a keen interest in this and being able to explain it to friends and family so they understand, I know a few people wanting to start MBing (including a family member living with me). Could two people have a flutter themselves from the same household on their own device, using their own accounts etc. without ruining the whole game for one another? The reason I ask this here is you personally must have had friends, family or flat mates take an interest. I’ve come across promotions on a few sites that pay you to refer people so surely if the system isn’t being abused, is it possible to have more than one person under the same roof do a bit of MBing? I mean if the bookies can apparently see past VPN’s and spoofed MAC addresses then shouldn’t they also be able to distinguish between the betting pattern and frequency of 2 people? Would appreciate any feedback you can give me on the subject, thanks. Hi, unfortunately I’m unable to provide any advice in this area. is it possible for a Nigerian to make money match betting?